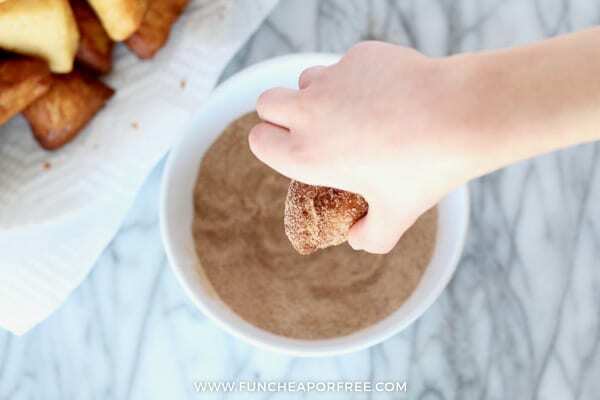 A quick and easy donut hole recipe that can be made with 3 ingredients in just about 3 minutes! That's right. 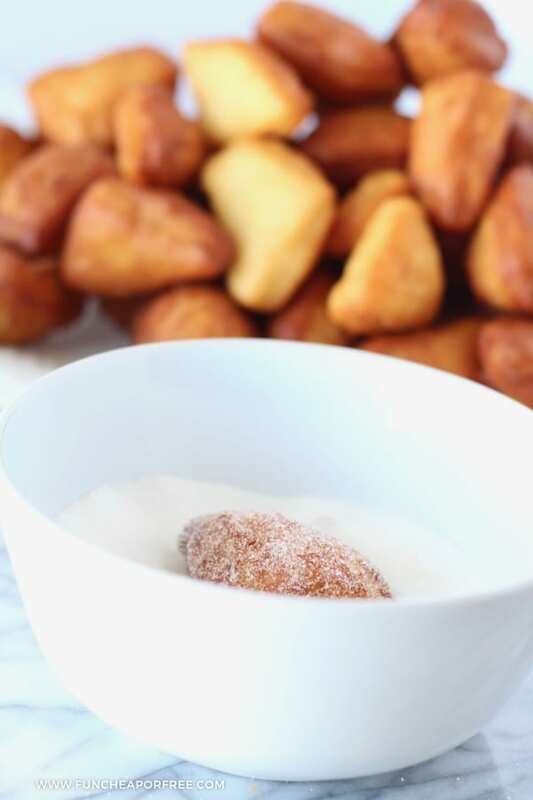 You're gonna want to put these donut bites in your arsenal of cheap homemade treats. You're welcome. Ok. Let's get real here. I'm going to issue you a BIG. FAT. (literally) WARNING. 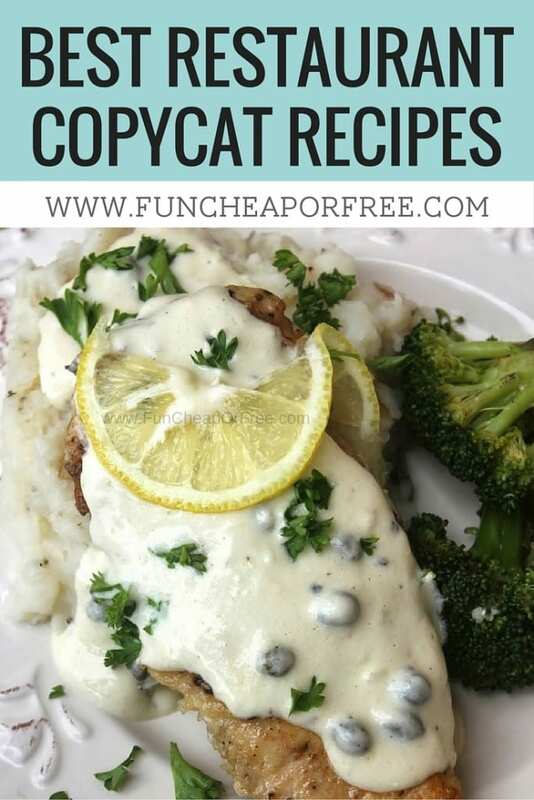 What I'm about to show you, introduce, knock your socks off with is cheap, easy, and really really really really really delicious. Oh yeah, and they are about a million calories each. Let me tell you how I happened upon this amazing, cheap and delicious donut recipe. I don't spend much time on Pinterest, but when I do, I choose a few gems here and there to pin for “down the road” when I don't have 3 kids screaming and yanking on me all the time (…so…maybe the year 2062?). But I saw THIS pin and had to try it asap. I didn't even take good pictures of the process because it had no instructions or description, just pictures. So naturally I didn't expect it to turn out so well. BOY was I wrong. 1. Get yourself a can of biscuits. I got THIS kind, but her picture had honey butter biscuits. Mine turned out great though, so just go for the cheap-o Walmart ones. 2. Heat up some oil. I used vegetable oil, and I put a few cups in the pot (maybe 4-6?). Let the oil get REALLY hot; if it's not hot enough it'll just make your donuts greasy. Buttt…. make sure its not too hot or the outside of your donut will be black and the inside will be raw. And nobody likes raw donuts. A trick I learned is to put the handle of a wooden spoon into the middle of the oil. If bubbles rapidly flow around the handle, then it's hot enough. Thanks for that one Rachel Ray! 3. 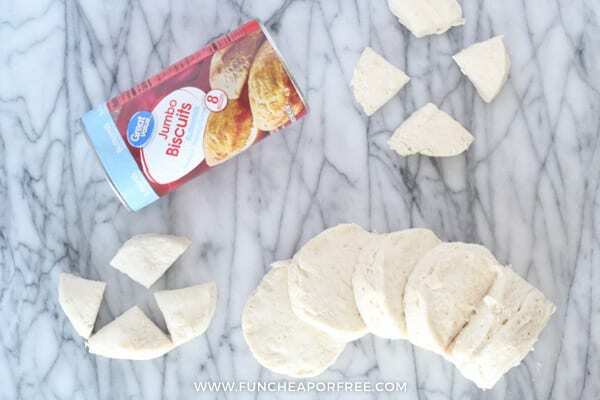 Cut your biscuits into 1/4 pieces. Drop them into the oil, I did 5 or 6 at a time. They cook really fast, probably less than 1 minute. Take them out when they get nice and brown. I used an oil strainer (like THIS ONE) to bob them around in the oil to get both sides fried evenly. 4. Set your donuts on a paper towel for a minute or two. Let those cute little donut holes cool off before you try to handle them with your fingers. 5. ENJOY. And thank me. Then hate me. Then thank me again. 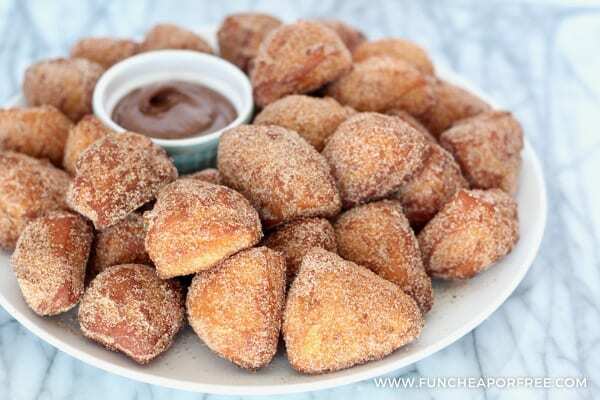 If you want to go for a more Churro type flavor – add some cinnamon to your sugar and coat those delicious donut holes. Don't be afraid to let the little hands get in and help. They'll love helping in the kitchen with this project. So good, so easy! And sooo fast. Let's be honest, it took me longer to figure out how to open the dang can then it took to cook the things. 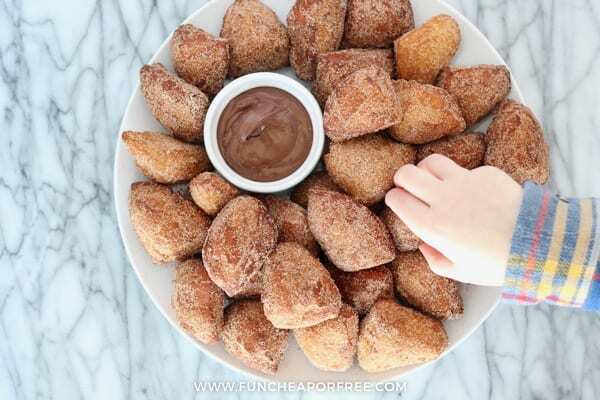 Go the extra mile and add a little nutella to the table for dipping these sweet donut bites. I mean, it really can't hurt at this point. 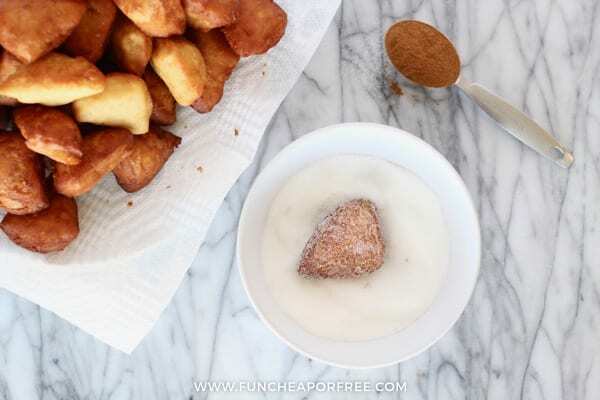 A simple donut hole recipe made with canned biscuits! 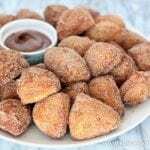 So quick and easy - you'll love these little donut bites. Cut your biscuits into quarters and heat up some oil in a pot on the stove. Check your oil and make sure its hot enough (but not too hot). Test one donut bite first before throwing a bunch in. Cook for 40-50 seconds on one side and then flip and cook for another 40-50 seconds on the other side. Set donut holes on a paper towel to cool off. Then coat in sugar or cinnamon and sugar. Optional: Dip in some kind of delicious chocolate-y sauce. 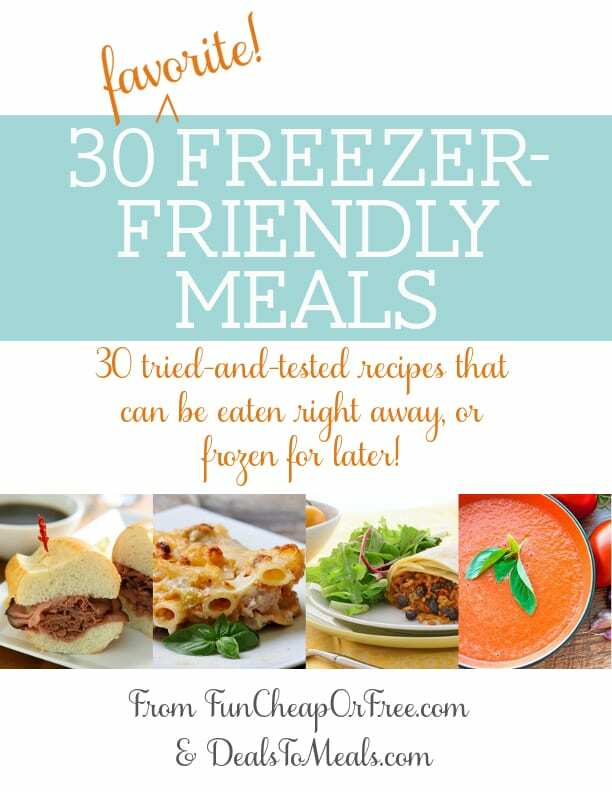 Try them and let me know if you enjoy them as much as we did! Perfect timing! I was looking for something to take to a playgroup brunch tomorrow. These will be perfect. Thank you! I used cinnamin sugar to roll them in but yes they tasted great! thanks for the recipe! Oh my word that sounds AMAZING. Thanks for sharing! Have to make this for the office staff! Thank You! We used to make these all the time! They are amazing and yes addictive! To take it a step further I like to dip them in melted chocolate frosting! I totally forgot about these donut bites. I used to make them all the time back in the 60's. When my husband becasme diebetic I kind of got away from sweet desserts But will have to try the again when the grands and great-grands come to visit. We make ours in the fry daddy. We go the extra step and take an empty pill bottle and make actual donuts and donut holes. 🙂 I must agree that they're addicting! thanks for the pill bottle doughnut tip. Now I will save a trip to DD on some cold Chitown mornings. I've been doing this for about 45 years.. <G> Yummy, all the way! No Doubt about it.. 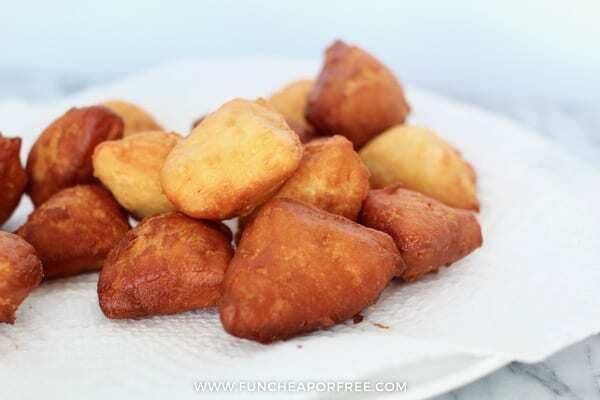 I remember my mom would make donuts usibg this method growing up so I was looking forward to trying the bites. However some of the bites didnt get cooked in the middle. 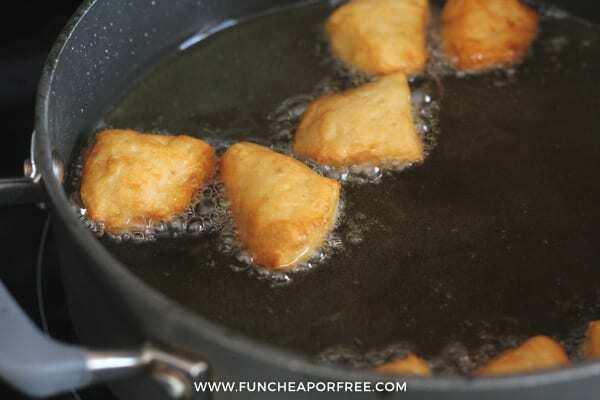 It seems like the first batch was good but after that the oil became too hot and browned the dough rsther quickly therefore re ceieved less time frying. Any ideas to fix this would be appreciated! Great Share! My Wife, Sara, and our two kids all made doughnut bites this Sunday morning by following your blog post. I had seen it as couple weeks ago and sent the post to Sara. Thanks again! Yummy. Wow, I am going to try this ! from the pics the biscuits must be thick so i hope i get some that will make these treats……looks like I am from the dark ages as i have never seen this method before. Use any kid of bread dough! 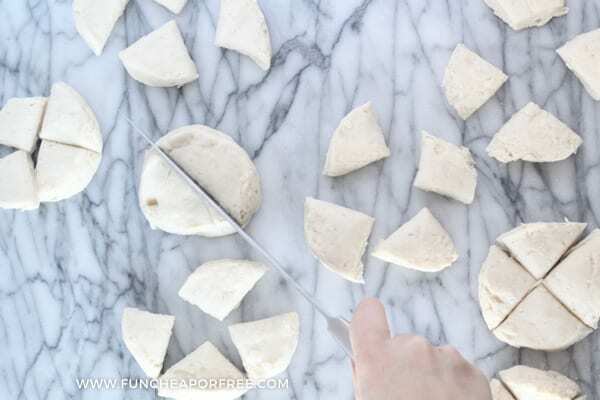 You can make your own bisquits very easily…. Add flour, baking powder, salt and sugar to bowl mix together. Cut in shortening or butter to resemble coarse crumbs. Add half the milk and mix, then add remaining milk and mix together. Put on floured surface and kneed gently 15-20 times. What is a ‘can of biscuits’? Not sold in Oz. Is this raw biscuit(cookie) dough or is in more like bread dough? It’s a Pilsbury product. You probably don’t want to know the amount of preservatives in it (yikes!) but here’s what it is: http://www.pillsbury.com/products/biscuits/grands-refrigerated-biscuits. Honestly, you could use any basic dough recipe! I rolled them out and put a dab of dulce de leche inside and cooked them that Way. Rolled in sugar you’ll never eat a normal doughnut again! What cell phone/camera do you have? My Nokia 1020–supposedly great HD pics– cannot begin to look this good. I had an iPhone 5 when taking these pics! Of course! You’ll get an email, you will need to click that email to confirm that you’d like to be on the list. Thanks for subscribing! We always used either cinnamon sugar or confectioners sugar to roll them in. Also of you want big doughnuts just use the whole biscuit and cut a whole in the center. You can then cook the doughnut holes too! Great memories of my mom making these during my childhood! Love the idea of big donuts! Thanks for sharing! hi! 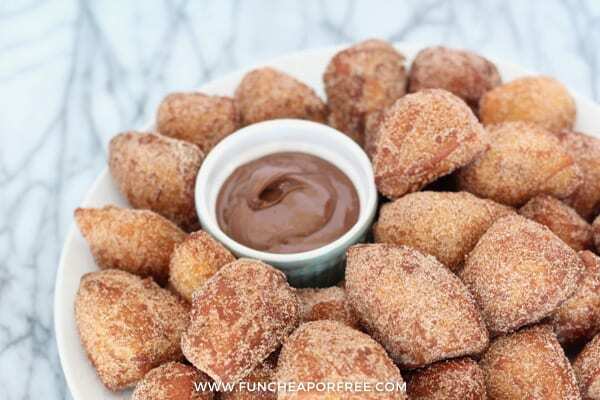 Something similar- pkg of crescent roll dough- fold triangles of dough around a chocolate-roll in a ball- have guests deep fry in a fondue pot and then roll in cinnamon sugar. Life is like a box of chocolates; you never know what you are going to get! I live in UK and can’t get hold of these biscuits so could I use Jusrol croissants cut up? I use the really cheap thin biscuits and fry them whole and coat in powdered sugar or regular sugar. Then I put various fillings into piping bags with a very large decorating tip on the bag and make filled donuts. I have done this using both Jelly and Wilton’s Buttercream icing. I plan on trying Nutella next. It looks so delicious. Thanks for the recipe. Oh man I almost I didn’t know how to do this now! Drooling! Oh the memories! My mom used to make these exactly like this for us when we were little…..over 50 years ago! I used to make them for my kiddos too when they were young! So good!